ASPEN - Michael Franti wrote "Never Too Late," a song from his 2003 album "Everyone Deserves Music," about a fan from Wales who used to attend all of Franti's U.K. concerts. After a London appearance, Franti gave the man, whom he knew as "Scotty," a ride on the tour bus. Some time later, Franti learned that Scotty had been killed while hitchhiking. "I wrote that song thinking, 'What was it like for him to be hitchhiking? Was he running away from something? To something?" said Franti in a phone interview from his home in Hunters Point, traditionally one of the less desirable of San Francisco neighborhoods. Another inspiration for the song was Franti's adoptive father, who died just before "Never Too Late" was written. The father had been an alcoholic much of his life - "He just like to sit and drink alone" is a lyric from "Everyone Deserves Music" - but turned things around following a stroke: "He became a beautiful person," said Franti. As it developed, the song became about putting aside fright by seizing opportunities. The chorus is a reminder, a tiny-scale blueprint for how to get beyond fear: "It's never too late to start the day over/ Never too late to pick up the phone." Some years ago, performances of "Never Too Late" were introduced with a rap about political and social involvement, and the expectations that come with such activity. In a concert in New York City that coincided with the 2004 Republican National Convention, Franti cautions the audience not to believe that George Bush was going to see a protest scrawled on a piece of cardboard and suddenly see the light: "I saw your sign and I agree with you: I'm calling the war off," he says in a mock-Bush voice. "Somehow it doesn't happen that way," concluded Franti. For his recent concerts, Franti has dusted off and reworked "Never Too Late." Bush is no longer in the White House, and Franti - who rapped "Bush War I, Bush War II/ They got a war for me, they got a war for you" on "We Don't Stop" - couldn't be happier about that. One of Franti's newest tunes is the jubilant "Obama Song," and he appeared at the 2009 Green Inaugural Ball. Still, Franti doesn't believe that the election of Obama should be celebrated with a big sigh of relief, and satisfaction that Franti's leftist hopes - end of war, greater economic equality, abolition of the death penalty, etc. - are about to arrive at last. His message remains the same: Stay involved. "I've heard a lot of people say, 'He's going to disappoint me.' Other people say, 'We have to hold him accountable to his promises,'" said Franti. "I say, instead of waiting for him to disappoint us, or be held accountable, I've been trying to re-tune my head to ask, 'How can I help him achieve his promises?' I think this country should have health care, work for everybody, clean-energy policy, and not be in a constant state of war." The message of civic participation continues in Franti's latest album, last year's "All Rebel Rockers," a dub/reggae work that was recorded in Jamaica with the prominent rhythm team of Sly Dunbar and Robbie Shakespeare. "Hey World" is a call to arms, to shake off apathy: "I didn't come here to chill, I came here to rock ... You got to let go of remote control." Just as people look at Obama as more than a politician, so do they look at Franti as more than a singer. Franti's show Friday at Belly Up was a quick sellout - even at $65 a ticket, for an acoustic performance - and a second, early show was added. No doubt, many concert-goers are looking for not only a good time, but also some political fire, a sense of community and some message that will lift their spirits. Given the current mood in the public sphere, Franti is more focused than ever on providing that last element. "When I'm approaching writing songs, and what we're going to play, I want to make the shows part spiritual, an ecstatic spiritual experience," said the 42-year-old father of two, who began his artistic career as a poet, sang in such fiercely outspoken groups as the Beatnigs and the Disposable Heroes of Hiphoprisy before creating his own band, often billed as Spearhead. "I think people right now are looking for a lift. They got bogged down - I get bogged down - looking at the newspaper, with all the bad economic news." Franti has always wrapped his activism in a ball of fun. His concerts could not be called deeply reflective experiences; his mix of hip-hop, reggae and soul is designed to move feet as much as hearts. Even on his current acoustic tour - which features J Bowman, whom Franti first hired as a studio engineer before discovering his talent on guitar - the emphasis is as much on fun as philosophy. "It's a chance for people to get out of their minds and into their bodies for a little while," he said. Franti doesn't see it as escapism, but as part of that idea of involvement: Go out, dance, smile, spread some fun, get the mood moving in the right direction. "I also feel a deep optimism and that's what I try to bring people - a sense of getting involved: 'The world is screwed up, and what can I do to make it better?" Franti considers himself in a fortunate position to help rally a spiritual recovery. He's not working with numbers or job-creation, but in a different realm. "A musician has this rare opportunity because we deal with emotions," he said. "It's different than a policy-maker or a teacher or a relief worker. Sometimes you have a song and think, 'Wow, this isn't directly political - but it speaks so much to me.'" While Franti deals in lyrics and melodies, it's impossible to accuse him of staying safely on the sidelines. Deeply critical of the war in Iraq, Franti took a trip, in 2004, to Iraq, Israel and the Palestinian territories to see for himself the human cost of war and the possibilities for peace. The film "I Know I'm Not Alone" documents the trip; the 2006 album "Yell Fire!" was largely inspired by the experience. Another way that Franti distinguishes himself from a politician is that he doesn't see his primary role as public service. As much as fans rally around him, he sees his duty is not so much to address their needs as to be a poet/musician. "I feel responsibility to make great art, make great songs," he said. "I don't think of it so much a responsibility to my audience as to myself. My responsibility is to put my heart into my songs and hope they will connect." 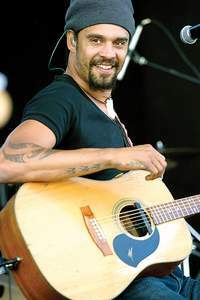 It just so happens that Franti, who is tall, charismatic and (my wife tells me with certainty) handsome, has the gift of connecting. (My 9-year-old daughter is also a fan; Franti is about the only pop singer she has ever showed enthusiasm for.) One of his latest creations, "The Sound of Sunshine," is an example of the way he connects: The song relates to the tough times people are experiencing; the central image is of a sunset. But it is balanced by finding hope in what can be accomplished. "I was in my room one day as the sun was going down. The blinds were making amazing shapes, with the clouds, shadows, the sun," he said. "And I said, 'What's the sound of the sun going down?' I was thinking about the sun going down in my neighborhood, on the streets of the world. "We all have these difficult times going on. But at the end of the day we've finished the work we need to do, and we have that moment to enjoy it."